The history of the Garden Villas neighborhood can be traced to 1833 when Henry B. Prentiss, a colonist from Massachusetts, received his land grant from Stephen F. Austin. His prairie land covered almost 3,200 acres near Sims Bayou. Prentiss never used the land and it passed through several owners over the next 50 years, having once been sold for $2.75 in delinquent taxes. Not until Samuel Ezekial Allen (no relation to the Allen brothers who founded Houston) purchased it in 1882 was the land developed by its owner. Allen had paid $4,000 for the acreage. Allen had inherited his father's cattle ranch, which he expanded to 13,000 acres. Allen's operation was so vast that he had his own boat landing and railway loading pens. 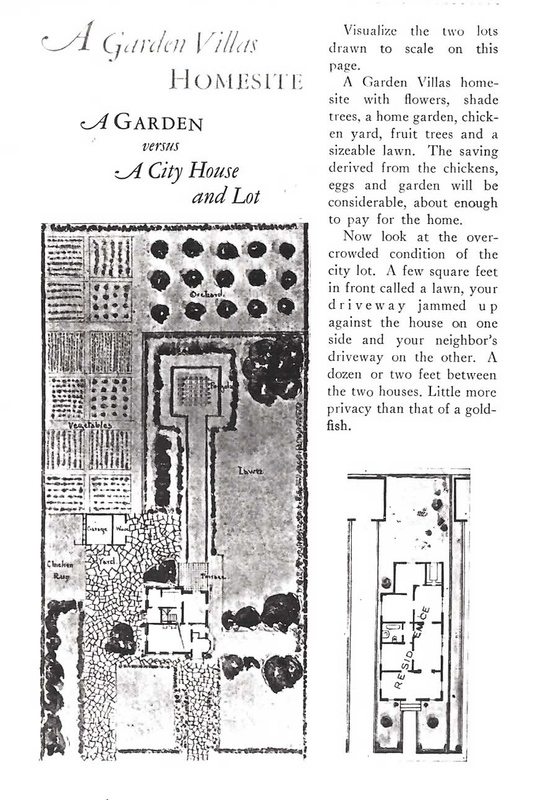 The Allens also had orchards and vegetable gardens, features that would be promoted in the 20th century development of the property. ​An Allen descendant has confirmed that in the 1850s camels grazed on this land, as well as that of Francis R. Lubbock, whose ranch was just east of Allen's ranch. This was an experiment of the United States Army where North African camels were used to carry mail and small equipment through regions of Texas. Although the plan failed because the animals were difficult to handle, the sight of camels meandering on the outskirts of Houston caused quite a stir when seen by travelers. By the early 20th century as residential development moved southeast of the city, lumberman W.T. Carter eyed this area for potential development. In November 1924 the Allen Trust sold 875 acres of the family's property to the W.T. 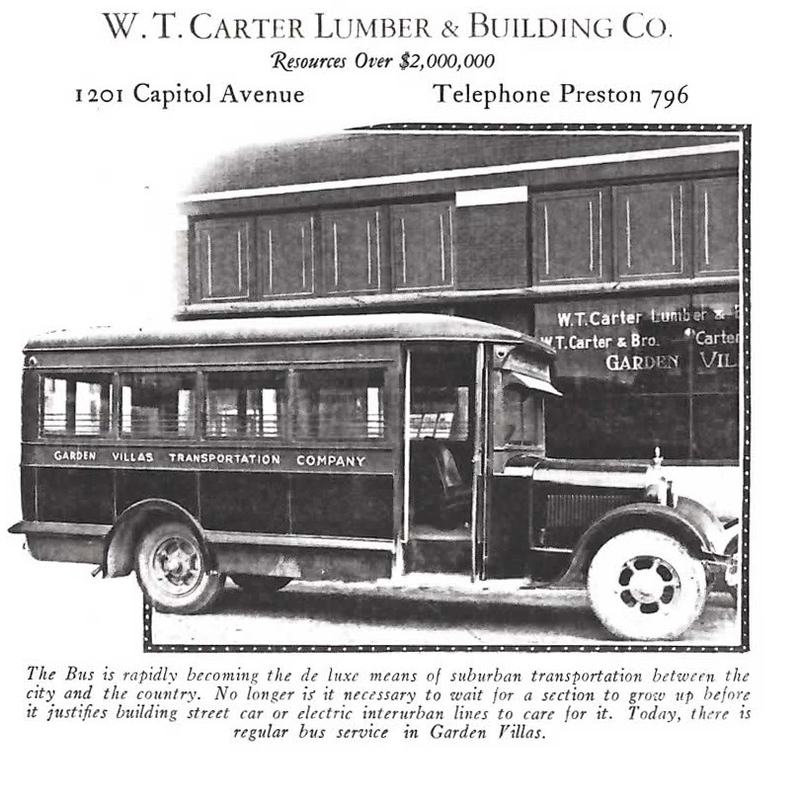 Carter Lumber and Building Co. for $142,480. On the 12th day of August, 1926, W. T. Carter Lumber & Building Company, “executed an instrument (platt plan) wherein it was recited that the company had acquired title to certain lands in the H. B. Prentiss, Blas Berrera and Joseph Kopman Surveys in Harris County, Texas”. These tracts were platted into lots and blocks. Most lots are an average of 125’ x 260’ with an alley at the back for “electric lights, sewerage, and artesian water”. There were no city taxes. Bus service to Downtown cost a quarter round trip. The Carter Company held a contest on naming their new development. The prize was a lot within the sub division for the best name. With over six hundred entries submitted, the clear winner was chosen: Garden Villas. Edward Wilkinson, a young Englishman who had studied at Rice Institute, was staff architect for Carter's company. He employed a variety of styles for the residences. One of the houses was advertised as a "ranch house type," the first known use of that term in Houston and quite appropriate for a former ranch setting. Wilkinson placed the Garden Villas Elementary School (1932) at the center of his town plan with the Methodist and Episcopal churches surrounding it. In spite of its rural ambiance and “remote location”, the subdivision was laid out just west of Telephone Road in a formal pattern with its radial cross streets focused on the “master planned” community center near Sims Bayou. Six thousand pecan trees were planted on both sides of every street which become a shade canopy for the entire neighborhood. Over seventy-five percent of these original trees have survived hurricanes and redevelopment. While Garden Villas seemed quite removed from the bustling city seven miles away, Carter ensured that it would be close to a most modern development when he built an airfield nearby, where in 1928 air mail delivery and passenger service was instituted. In 1937 Carter sold his airfield to the City of Houston, which built a passenger terminal in 1940 by Joseph Finger. That original airfield has continued to expand, and today is known as William P. Hobby International Airport. ​Most of the original homes constructed from 1926 to 1930 are in the 7400-7300 blocks of the alphabet-named streets (Ashburn, Brace, Cayton, Dillon, Evans, Fauna). The housing boom continued until World War II and then in 1958 Garden Villas was annexed into the City of Houston. Home construction continued, filling up the entire 876 acre subdivision. Today, the neighborhood continues to thrive, with its own non-profit radio station (KHGV 99.7 FM), an active Community Association, and many other amenities, including two roaming "musters" of peacocks. More than 1,000 single family homes grace the once-remote neighborhood called Garden Villas.